A series of bizarre events surround a young man’s journey through the hedonistic landscape of first century Rome. A comic strip detective finds his life increasingly complicated as he investigates the notorious Big Boy Caprice’s mob. The continuing adventures of Hellboy and his paranormal friends. A demon that was brought from another dimension by Nazis is raised by a secret US organization to protect the world from darkness. A young man discovers he can time travel and decides to use his newfound power to help land him a girlfriend. In the future of 1994, the world is dominated by celebrity, rock status, and the winner of an American Idol style battle of the bands where Mr. Boogaloo, the producer of the show and agent/manager for the winning band tugs the strings of everyone except Alphie, a folk singer who sees through his lies. Oh, it’s also a retelling of the story of Adam & Eve. After a doctor buries his daughter’s dead cat in a mysterious plot of land, it comes back to life and strange incidents begin to occur. A fourteen-year-old foster kid is granted new powers that allow him to turn into a superhero. Security guard David Dunn uses his super powers to track a psychotic man with multiple personalities who calls himself “The Horde.” Simultaneously, criminal mastermind Elijah Price aka Mr. Glass hatches a new plan. A young pilot finds a jetpack that allows him to be a masked hero. Eighteen-year-old Charlie finds out her new car is actually a robot alien fugitive. An “against-the-odds” couple kidnap one of the Arizona Quintet babies when they learn they are unable to conceive a child themselves. Everett, Pete, and Delmar aren’t just down on their luck during the Great Depression. They are chained together in a chain gang, till they break free in an attempt to find buried treasure that is. A family on vacation is terrorized by a group of doppelgangers. When an evil force threatens the safety of all worlds, a young boy, who dreams of monsters and men, travels to a mysterious world where, with the help of a gunslinger, decides to take matters into his own hands. Wizard Newt Scamander finds himself wrapped up in an adventure that pits him and his friends against the evil Grindelwald. In a post apocalyptic steampunk world where cities are mobile and consume smaller cities to survive, two people try to stop a conspiracy. When Jake Blues is released from prison, he and his brother Elwood are set on a mission from God, to save the orphanage they grew up in without tainting any of the money through illicit means. A lonely fisherman takes a peculiar job from a mysterious woman. A telepathic man who dwells in the underworld of Spain prepares for his death. This is a weird freaking movie. Don’t get me wrong; this film boasts lot of great moments. It’s made with a lot of class, and it is trying to say something profound, but there are some incredibly disturbing and downright disturbing moments in this film. While I can say I’m happy I watched this movie, and it’s one that I’m sure will stick with me (for better or worse), I wouldn’t ever recommend this to someone unless I was sure of their current state of mind. Why? This movie sent me into a slump. I’m still kind of bummed out over this movie, and I wouldn’t want to send anyone into that state of mind without reason. This film is essentially a two-and-a-half hour mediation on death and what comes after. There are some depressing movies that I think everyone should see (Schindler’s List is a film I feel should be required viewing for all high school students); this is not one of those films. 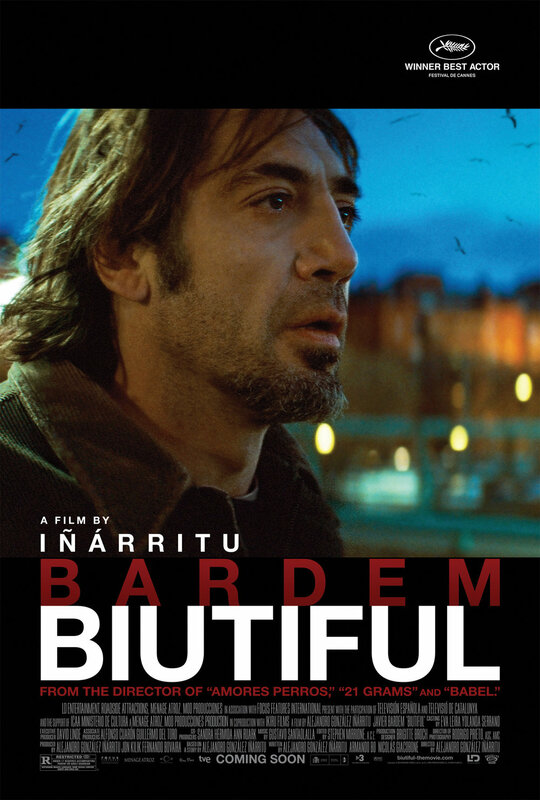 If you miss this movie, don’t worry- this isn’t Inarritu’s best, nor is it Bardem’s. I was honestly a little surprised when I saw this was nominated for two Oscars (Best Actor, Best Foreign Language); it’s good, sure, but not great. It must’ve been slow in the Foreign Language category in 2010. Uxbal (Javier Bardem, "No Country for Old Men”) is a telekinetic man living in Spain who can see the ghosts of those who have just passed on. He makes his living through various underground dealings- illegal sweatshop labor, drug dealing, and the occasional pseudo séance- encouraging troubled spirits to pass on to whatever lies beyond. He has two children, Ana and Mateo, and a bi-polar wife named Marambra (Maricel Alvarez, To Rome with Love), with whom he constantly bickers. After Uxbal receives news that he will die, he tries to come to terms with that, while also preparing his family for what’s to come. As I said at the top of this movie: this is a weird freaking movie, and a lot of that has to do with how the story is laid out. The story structure in this film is odd in that it doesn’t really grab you from the very beginning- it sort of eases you into Uxbal’s world and forces you to pay attention and put things together. In a way, this story’s structure reminded me a lot of Inarritu’s Babel. In both films we’re shown characters that have very a very tenuous connection, and then as the film progresses the connections become more and more apparent, and so does the gravity of those connections. It’s like the film tosses you in the deep end and expects you to swim; for the first few seconds you flounder about, but then as you catch your breath, things become easier. There are things that I really found interesting about this film; first and foremost, the telepathic aspect of this movie. As this film is more a mediation on death than anything else, it’s interesting to make the protagonist a character that is 100% certain that there is some sort of existence after death. Uxbal walks around with the weight of death constantly on his shoulders, but at the same time the thought of dying doesn’t seem to bother him- what bothers him more is not knowing how his kids will survive after his passing. Death, for Uxbal, is not the end, but just another doorway; a gateway to something else. Death becomes not a thing to fear so much as it is a thing to welcome. A lot of the themes of this film could be boiled down to this one quote (I love Murakami!). Uxbal seems to be searching for a way to pass on that will give his life more meaning than it had when he was living it; a final exclamation point at the end of that last sentence. This film is about presupposing that life does not end at death, and letting that guide your actions in this life, so that you might find your way forward in the next. I really liked some aspects of this film, and others I thought were a little indulgent and pretentious. I also thought this film was a bit long, and while I think a few edits would’ve improved the pacing, I’m sure the slow deliberate pacing was exactly what Inarritu wanted. In my opinion, Inarritu’s later films are the better ones- I love Birdman, and The Revenant was really good too. While this is a good movie, I can’t say I’ll return to it any time soon. I don’t mind a dark and depressing film, but one that mires about in depression for this long isn’t good for my mental health. Sadly, I said a similar thing about one of the other films I reviewed for our Cinema World Tour: Spain series- The Skin I Live In. Both films were well done, but difficult to get through. Biutiful lost the Best Foreign Language Oscar to The Secret in Their Eyes, which I loved! Coincidentally it’s also in Spanish, though it’s from Argentina- that one is also disturbing, but not as depressing ( it’s much better than this). It’s also really intriguing and fast paced where this film is more methodical and meditative.